Autism Pirate: The Movie is Better Than the Book. How many times have you heard that? Probably not as many as the reverse of that statement. Rye LOVES movies. We let him watch a lot of movies on weekends because he doesn't get that privilege during the week, and he works really hard Monday through Friday. We first noticed the advantage to "vegging out" to movies when he started playing baseball last year. The first few games were horrible. Fits about not getting to field the ball every time. Fits about not being able to run past first base. Fits about the game being over. And so on… Then along came a movie called The Sandlot. Wow! Within that movie, came the power of understanding the game of baseball. Also, came the phrase, "you play baseball like a girl!" (but that's a blog for another day!). But because he loves to watch movies, and they capture his attention like no other tool we have, we can effectively teach Rye many things with a movie as a reference. Yes, we feel guilty about the amount of time he spends watching movies on weekends. Yes, we feel like it's a cop-out at times to use a movie as a teaching tool. And yes, we wish it were different. But it's not, and as the saying goes, "if the shoe fits…"
So i wrote a blog not long ago about how Wyatt and I play basketball. We're always trying to get Rye to play with us and rarely he does, or IF he does, he really doesn't want to. I rejoiced a few weeks ago when I asked him to play and he said, "ok, but only for 10 minutes." Then guess what? Along came another movie… (you saw it coming) Space Jam. This past weekend, I couldn't get Rye inside because he wanted to play basketball. At least three times on Saturday, he dragged me out to play a game. 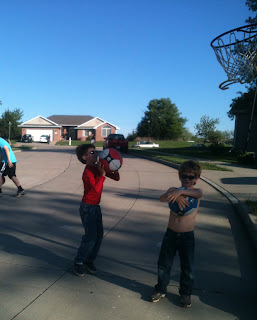 We play at our neighbors, they have a "low" rim and is perfect for Rye and Wyatt. So the three of us started a game and were having a blast playing a game of basketball. 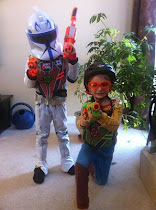 And Wyatt… was REALLY on cloud nine because he's always trying to get his brother to play something other than light sabers. We were playing (them against me), and the neighbor kid comes out to play with us. I quickly calculate what the best team options are for RYE… to have a successful basketball game experience. I do this all the time, and yes, again, with guilt toward Wyatt because I know he can adjust and adapt more easily than Rye. So Rye and I vs. Wyatt and Trevor. Now comes the second major calculation… who wins the game? I'm old, but i'm twice the size of all of these kids and the rim is at my head. I decide that Rye needs the experience of losing a game. And so he does. As anticipated, he has a pretty big fit about it. But later that day, we go out for another game. This time it's just the three of us and Wyatt and Rye beat me. Our life is about calculations and creating teachable moments with every activity. But first we have to get Rye to engage in the activity. And for that, we love the power of the movie. sounds like a major success to me! Way to go, Tara.